Background: The type of disaster, individual demographic factors, family factors and workplace factors, have been identified in the international, multidisciplinary literature as factors that influence a person’s willingness to attend and assist in their workplace during a disaster. However, it is unknown if these factors are applicable to Australasian emergency nurses. Aim: The research aims to determine the extent to which Australasian emergency nurses are willing to attend their workplace in a disaster. Method: This research was exploratory and descriptive study design, using online and paper based surveys as a means of data collection. Australasian emergency nurses from two Australasian emergency nursing colleges and four Australian hospitals were recruited to participate. Data analysis was conducted using both descriptive and inferential statistics. Results: In total, 451 Australasian emergency nurses participated in this research. Participants were more willing to attend their workplace during a conventional disaster (p≤0.001), if they worked full-time (p = 0.01), had received formal education pertaining to disasters (p≤0.001), had a family disaster plan (p = 0.008), did not have children (p = 0.001) and worked in an environment in which they perceived their colleagues, managers and organisation to be prepared. 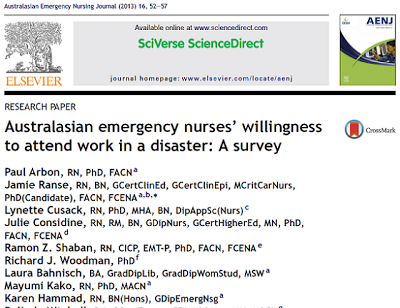 Conclusions: The factors that influenced Australasian emergency nurses to attend their workplace in a disaster were similar to that described in the international multidisciplinary literature. Of particular note, improving disaster knowledge and skills, having a family disaster plan and improving the perceptions of the nurses’ workplace preparedness can enhance the nurses’ willingness to assist in a disaster.